Below is the second of my, let's call them my "early writings." 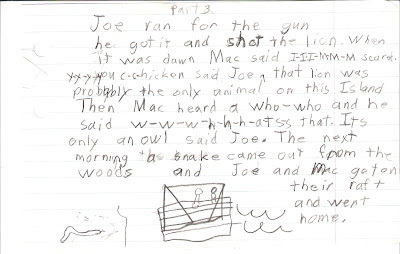 Again, these are the first stories I can remember formulating as a kid. All of them were 3 half page stories. 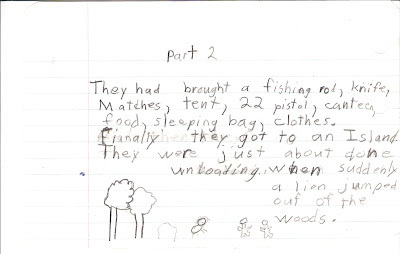 Evidently, I had a word limit at age ten too. This is another runaway fantasy of mine. It seems I was preoccupied with leaving home and all of the adventures that might come of it. It seems I favored 3 letter names. 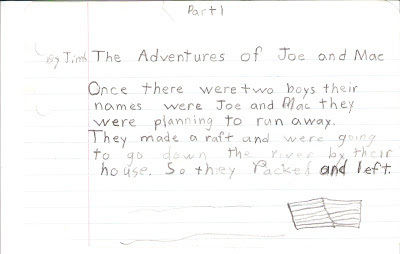 Evidently I liked to do my own illustrating. I was never good at drawing and here's proof positive. I cover this subject in more detail in my Draw Like an Egyptian post. Some kids got the talent, some don't. I'm a don't. I see lots of erasures and would like to know what I had written before it was erased. It could be a hidden gem like painters that reused their canvases. There might be a Michael Crichton thriller hidden in there. I don't know what's more disturbing, two young boys building a raft on a river near their home or the fact that the woods they live near have lions in them. I'm not sure there are any lions in North America at all, actually. It would be nice if I used quotes in my dialogue. The raft appears to be sinking in Part 3. 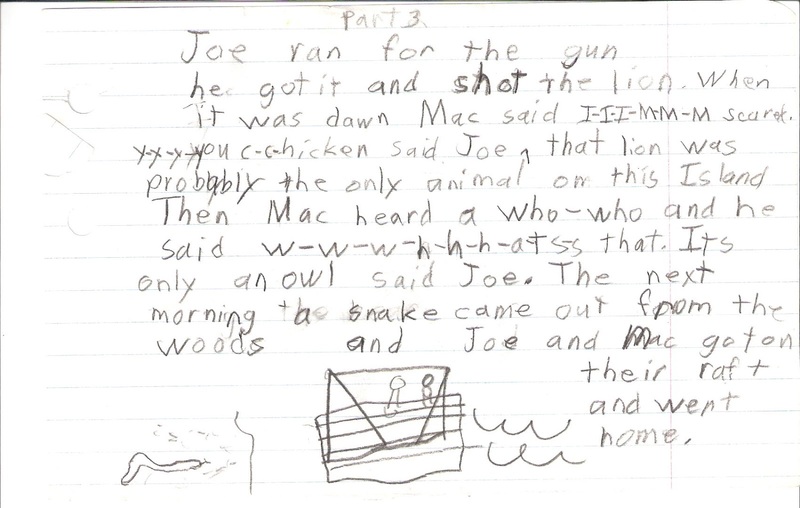 Boy kills lion with .22 caliber handgun. This might need some screenplay editing before Hollywood. I'm pretty sure my editor would say my ending was abrupt and inconclusive. As in the last story, I seem to have an underlying moral message to the reader. Don't runaway or you might get eaten by a lion that lives in the woods. 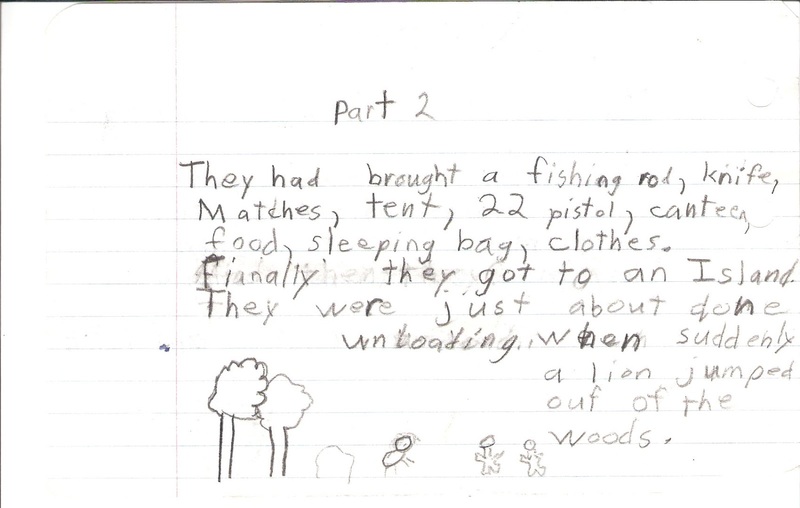 As funny as it is to pick at it, this is the mind of a 10 year old boy in 1971. 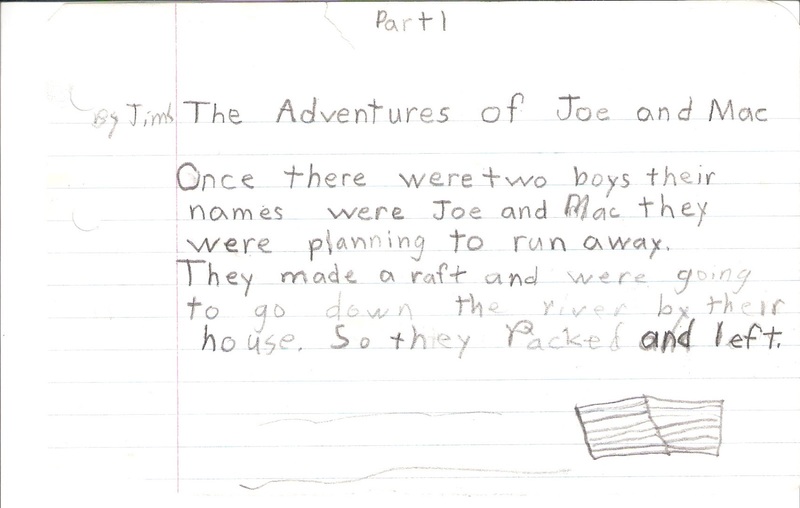 I was formulating my love for telling a story, albeit at an elementary level. 40 years later, I still struggle with the same things. Plots, characters, dialog, conclusions, action, etc. This was the beginning and I'm glad it happened. I wouldn't re-live it any different.